A Winning Week! — Dotty Mares - Mobile Horse box bar - Serving London and surrounding areas. It’s been an exciting week for the Dotty Mares! Not only with a successful wedding fair under their belt and a Marlow Family day coming up this weekend, but they have also won a competition! Just over a week ago, we decided to enter the #SBS (Small Business Sunday) competition which runs weekly on Twitter every Sunday night. The competition was started by former Dragon, Theo Paphitis who asks his followers to tweet him describing their small business within a certain time slot. After one unsuccessful attempt, the following week after the fabulous wedding fair at Morden Park House, our second-time lucky tweet was sent with a lovely photo of Dotty attached. A little while later, Dotty Mares HQ was being bombarded with messages of congratulations and a spike in over 100 followers, only to find out that the Dotty Mares were one of 6 lucky winners chosen by Theo Paphitis himself! With his twitter platform reaching nearly 500,000 followers, the Dotty Mares were overwhelmed with the boost that winning this competition has provided and were up until midnight sending their thank-you’s to all the tweeters! On top of the huge social media boost this provides, they also now have a shiny little badge which you can see on the left. 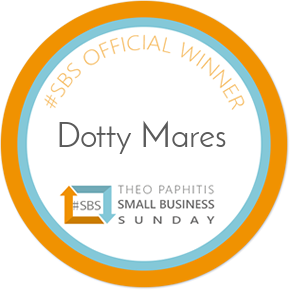 This has been a fantastic win for the Dotty Mares and just shows the power of social media and how important it can be to connect virtually with other like-minded small business owners and have the endorsement of Theo Paphitis behind them! From now, it continues to be onwards and upwards for the Dotty Mares, hoping to see lots of lovely mothers and their children at this weekend’s Activity Day in Marlow raising money for Great Ormond Street’s Children’s Hospital and their research into leukaemia, see here for more details! Newer PostA New Venture for the Dotty Mares...?